Saw Trax Support, Author at Saw Trax Manufacturing, Inc.
What are the major factors you should look for when buying a panel saw. There are two kinds of panel saws, vertical and horizontal. Each of them have pros and cons. The biggest difference is the space needed to work with these machines. The vertical saw takes up much less floor space, and is easier to load one sheet at a time. Without getting into the weeds any further about the types of panel saws, we will discuss the vertical saws for the remainder of this article since they are the most familiar/common and most likely used by small shops and Home Center stores. The second is the alignment system for the supported material to be cut vertically and horizontally. By tracking mechanism, we mean what allows the saw to move up and down the guide tubes for the vertical cross cuts. If there is “play” in this mechanism, the cut will not follow a straight line. 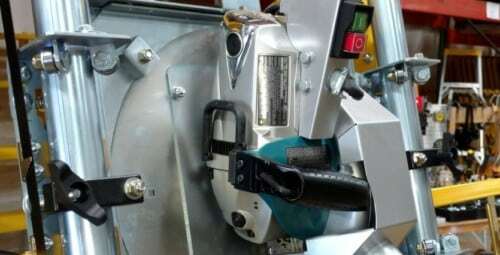 There are two types of bearings used in most panel saws. The first is a low cost U-bolt with nylon rings around the U. The rings are squeezed between the guide tubes and the U bolt at the same time. As these rings try to roll, the carriage moves on the guide tubes. A bottom button glide is used to “Load” (put pressure) on the U-bolt rings. As you might already see the flaw in this system is friction. The tighter you get the tolerances to take out the play, the harder it will be to move the carriage causing a trade off of ease of movement and accuracy of the cut. The Second Bearing system is using a “true bearing” using real sealed bearings. This is done by high end vertical panel saws typically costing over $25,000 but there is one company making panel saws for a tenth of that figure using actual bearings. This company, (Saw Trax Mfg. Inc.) makes their panel saws in Kennesaw GA. They use 3 sealed bearings per carriage corner for a total of 12 sealed bearings per carriage. This arrangement has two bearings on top to carry the weight and one bearing on the bottom to “Load” the top bearings. The bottom bearing ensures constant pressure during a cross cut. By using a true sealed bearing system like this, you get both accuracy and ease of movement during a cut. The alignment system consists of two elements. The first is ensuring the guide tubes stay square to the material rollers. The second is to make sure the material rollers stay aligned with each other. Different panel saw manufacturers handle this in different ways. One manufacturer has the outside rollers on hubs that have a centered hole and all the interior rollers on hubs that have off-centered holes. This off-center allows the interior rollers to be adjusted up or down to align with the outside rollers. The problem is there are no 10 ft. straight edges that allow the end user to re-adjust the rollers once they go out of alignment. This same manufacturer has users hit the guide posts with a dead blow mallet to adjust the tubes right or left when the vertical tracking goes out of alignment. Obviously, this can take a lot of whacking back and forth to get it right. A secondary issue is if you whack too hard, you can dent a guide tube and render your machine useless. Our issue with this system is there are 13 adjustments that can throw your machine out of square, the 12 interior rollers and the guide posts shifting. An innovative approach to the alignment system elements is to not have an indexed adjustment to the rollers and guide tubes. If all the rollers and hubs are the same, they don’t go out of alignment. If an adjustment is needed to align the fences, an indexing system is used to incrementally adjust the end of the fence up or down in 1/32″ increments and then locks into place. A similar indexing system is used for the vertical guide tube posts is patented. 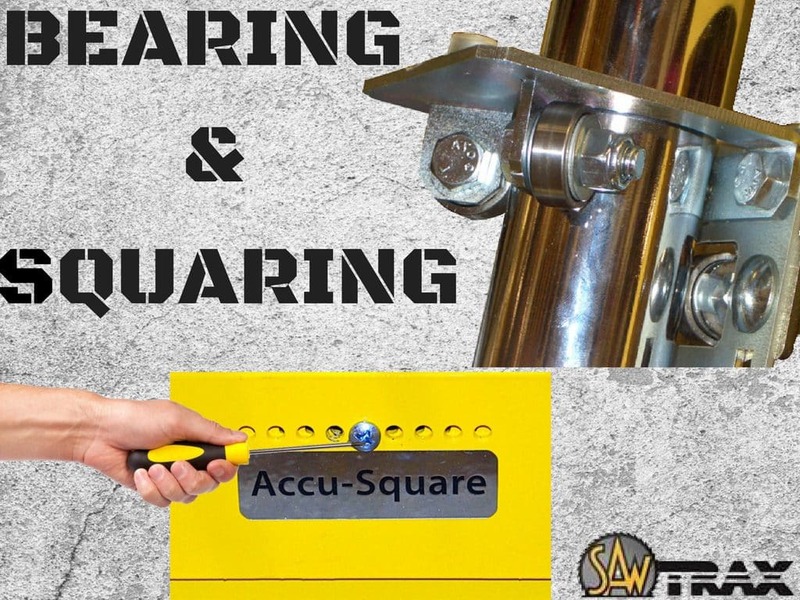 The manufacturer calls it the “Accu-Square“. Nine holes spaced 8/32 apart are centered in the frame. Another nine holes spaced 9/32 apart are centered in the bottom guide tube bracket. Only one hole in the frame and guide tube bracket will line up at any given time and adjustments left or right can be made in 1/32 increments. Once adjusted, the bracket is locked to the frame using a sheet metal screw keeping the guide tubes from ever shifting in relationship to the frame. This system is patented and is guaranteed to never go out of square. When you combine the dependable Makita saw with the sealed bearing and Accu-Square squaring advantages of the Saw Trax Panel Saws, the decision of which panel saw to buy becomes an easy one. by Michael Della Polla, President, Saw Trax Mfg. Co., Inc.
As markets change, products need to change with them. A nimble business like Saw Trax is flexible enough to adapt. The original yel-Low Safety Dolly is ideal for store use because of the small foot print, high capacity, incredible maneuverability and ease of loading. As consumers mail order items more and more, adapting products to a warehouse environment is called for. For warehouses use, a dolly needs greater capacity. It needs the ability to transition over dock plates and into trucks. As warehouses grow, dollies also need the ability to be moved by forklifts or pallet jacks over long distances. 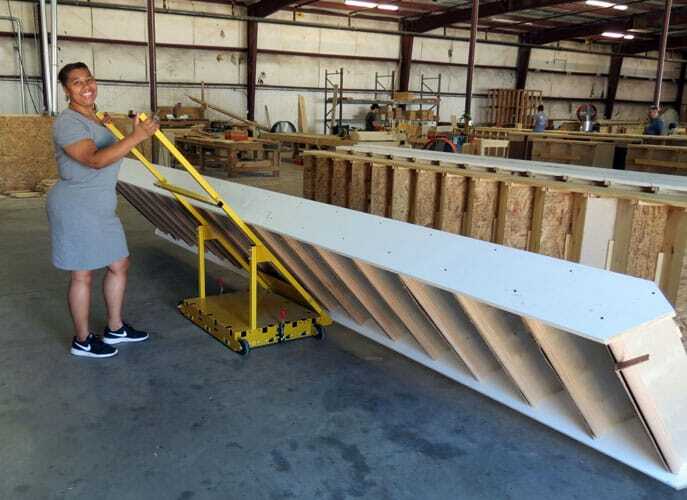 The Scoop Dolly is a new piece of equipment that allows one person to move large bulk items without picking them up. It works like a tilting hand truck attached to a fixed dolly. Unlike tilting “A” frame type carriers, just the scoop section or hand truck section tilts, not the entire cart. This design makes it much easier to for one person to load an item. It also allows the angle of the scoop to be changed to allow for different dimension materials to be carried. For instance, a 20-inch staircase can be carried which has a low center of gravity and an 8-foot-high Quad Door frame set can be carried on the same dolly simply by adjusting the angle of the scoop while titled back on the dolly. A second benefit of this design is the caster last longer. The tilting A frame dollies use an all caster design like ours. Casters are designed to be used flat. They use encased ball bearings to allow the wheel to spin. When you take the caster, and tilt it and put a heavy load on it, the encased ball bearing mechanism is stressed and the ball bearings come out of the caster making the entire device useless. By keeping the dolly part of the Scoop Dolly flat on the ground, our users don’t have this issue of broken caster or casters wearing out pre-maturely. Another new dolly is the EPJ (Electronic Pallet Jack) dolly. 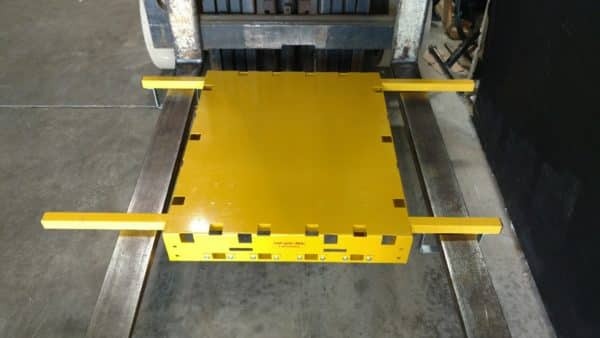 It is designed to be used with Electronic Pallet Jacks. 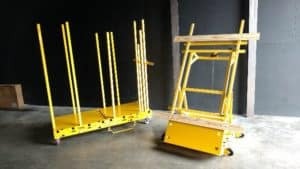 It consists of 2 or more attached raised safety dollies. These dollies can be attached on the 30-inch side or the 25-inch side. 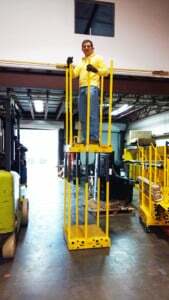 It uses the same post system of the standard yel-Low Safety Dolly. What sets it apart is are the “Pallet Jack Brackets” on opposite sides. These brackets are designed to allow the forks of an EPJ to go through so the dolly does not move on the jack when transported. With top heavy loads, this is critical. What is unique about the design is that these brackets can float up when transitioning dock plates for truck use. A center wheel in the dolly also facilitates the dolly going over dock transition plates into trucks. For more information on both dollies, see this informative video. For more information on Saw Trax and our products, you can contact us at (888) 729-8729.
by Mike Della Polla, President, Saw Trax Mfg. Co., Inc.
As the saying goes, “Necessity is the mother of invention”, said the founder of Saw Trax Mfg. Inc. a vertical panel saw manufacturing company. They needed a way to move the long, top heavy crated panel saws around the factory and into the freight trucks. Moving a long top-heavy object with a forklift is a difficult and dangerous process. The panel saws are over 10 feet long and 500 lbs. Some need special trucks with extra high freight doors for some models. Besides a forklift driver, a man had to walk in front to stabilize the panel saw crate so it didn’t fall over. By marrying a lifting and pivoting mechanism to their yel-Low Dolly, Saw Trax could make the Scoop Dolly. The Scoop Dolly is like a pivoting hand truck mounted to a dolly so the load can move in any direction. The arms of the scoop are supported when tilted by 2 support arms that can be placed in 4 bracing positions allowing to change the angle of the scoop to keep the center of gravity of an item over the dolly. This way you can carry a 3-foot-high set of stairs or an 8-foot-high door or window group by adjusting the support arms. Later that month, it was demonstrated it to a door and window manufacturer. “When I saw the gathering of workers starting to smile from ear to ear, I knew we had a winner for the door/window industry,” said Mr. Della Polla. The all steel and powder coated Scoop Dolly starts at $799. You can get an optional dock transition kit for $99.95 and a brake set for $109.95. A leverage handle is also available for moving large boxes that are not so top heavy like furniture. This handle is a $300 upgrade. Compared to a forklift moving top heavy objects, the Scoop Dolly is much faster to load, faster to move and faster to unload. It also makes the job much safer. For more information on the Scoop Dolly and other innovative dolly options contact Saw Trax Mfg. at info@sawtrax.com or 888-SAW-TRAX. 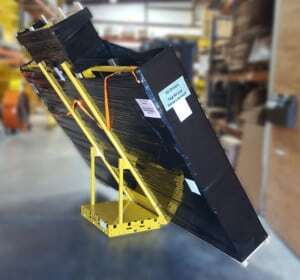 Saw Trax is developing an addition to the yel-Low Safety Dolly for distribution centers that want to brace items vertically on a dolly and move them a distance with a forklift or Electric Pallet Jack. Since some distribution centers are over 1,000.000+ square feet, it is not practical to push the dolly long distances when a mechanized option saves time. 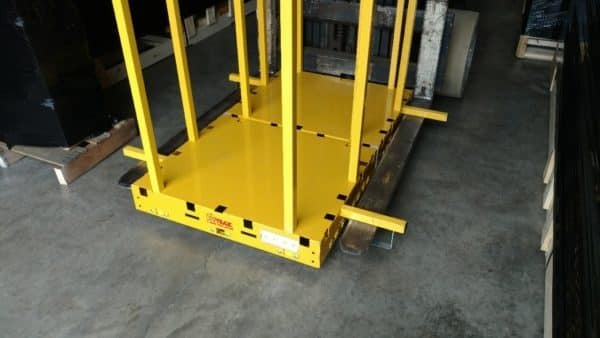 This version can be picked up with a forklift, maneuvered close to an item, load the item (or two), then moved again with the forklift, dropped off at a dock and then rolled into a truck. Dollies can be bolted together to increase capacity per trip using the same post system to brace materials during transport. The horizontal fork posts can be removed when not in use and stored vertically on the dolly saving floor space or permanently mounted to the sides. If a cabinet shop, a solid surface shop, or a home center store needed a panel saw for heavy duty use, they have traditionally turned to one that used a worm drive motor. These motors use a geared down drive mechanism turning at a slower RPM than a sidewinder saw but has more torque. So with a high cut load, a hard material to cut like man-made counter tops or hard plastics, the worm drive saw was called upon for the job. Sign Maker Panel Saw on Display at the NBM Show! 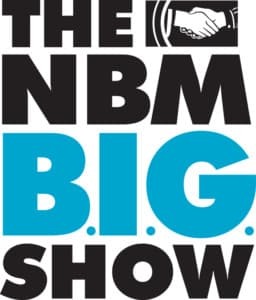 Saw Trax will be exhibiting this week in Booth 138 at the NBM Long Beach Show in California. THE NBM B.I.G. SHOW is the place for top industry manufacturers and suppliers to showcase their product lines and services. This is the perfect opportunity for those on the west cost to come view a demo of our Sign Maker’s Panel Saw. We will be showcasing both compact and full size panel saws at out booth during the show. See you there! Join Saw Trax Mfg at the BRExpo at the Cobb Galleria Centre March 8-9. We will be in booth 1427 showcasing both our line of vertical panel saws and our innovative line of dolly carts. What happens when you marry the tongue mechanism of a hand truck to the mobility of a dolly? You get the Saw Trax Scoop Dolly that easily moves bulk items anywhere. For years hand trucks have been used for movement of merchandise. They use a tongue that slips under an object. The object is then tilted back and rolled on 2 connected wheels. 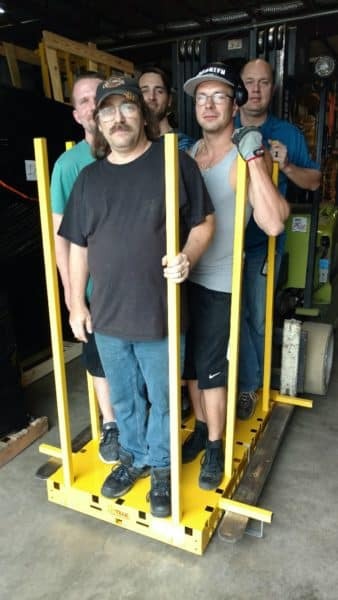 The limitation has been when an object is very wide, moving it with a hand truck becomes impractical because of the size of the path needed to move it. 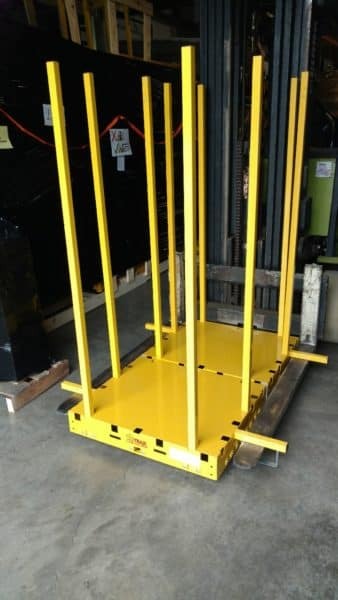 One of our customers wants to be able to stack the dollies without using a pallet rack system. In an effort to accommodate this customer, we have prototyped a stackable rack system that has 3 heights. The varying height would accommodate various mattress sizes. The idea would be to stack the dollies using a forklift. The top dolly would use extra horizontal posts for the forks of the forklift to easily go under and lift. We are planning on a 300 lb. limit for the top dolly. Which Panel Saw Do I need? Saw Trax Mfg., the industry leader in Panel Saws, offers several styles of panel saws to fit your needs. First, decide if you need one of our compact or full size versions. Compact frames offer a 60” wide frame and vertical cut height of either 52” or 64”. The compacts are great for shops or home woodworkers that may not have the room for a full size panel saw or for those users who will be taking their panel saw out to job sites. If your cutting needs require a lot of rip, or horizontal, cuts then a full size frame will serve you better. The Full size models are available in cut heights up to 100” and feature a 120” wide frame. Need even more material support ? Adding our Builders Extensions will give an additional 28” of material support (on each side) to both our compact and full size panel saws.